Call us now, for a free quote on our expert rug cleaning in Port Melbourne 3207! Our team of professional staff will be able to deliver truly transformative effects on a wide range of household rugs... and best of all, our expertly delivered services are guaranteed to offer a safe clean to even the most fragile or delicate fabrics. Our services would be nothing without our team of expert carpet cleaning technicians. All of our staff boast an extensive industry training, combined with many years of experience... allowing our rug cleaners in Port Melbourne to deliver swift and effective results, time and time again. 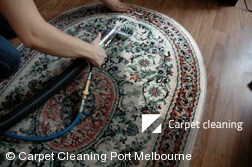 Book Port Melbourne Rug Cleaners Now! Give us a call now - on 03 8672 2773. Our expert staff are on hand 24/7 to answer any questions that you might have about our services... or help you to make an immediate booking. You'll even be able to request a free, personalised quote for our rug cleaning in Port Melbourne. Alternatively, you can use the form on this site to request a quote now... and take advantage of our competitive rates for cleaning rugs in Port Melbourne 3207. "It is always good to see someone whose work is worth the money. The cleaning that you offer is one of those cases. Good for you." "When I saw what came out of my mattress after the cleaning I realised on what I was sleeping for so long now. Now I’m sure that mattress cleaning really..."
"For the two months I had my leg broken I had no chance to clean my home properly. That is why I decided to hire professionals for the job. I'm glad I..."